Helloween is a power/heavy/speed metal band from Germany founded in 1983 by members of Iron Fist and Powerfool. Helloween are known as major innovators of power metal. In 1984 the band had signed a deal with Noise Records and recorded two songs for a Noise compilation record called Death Metal. The two tracks were “Oernst Of Life” by Weikath, and Hansen’s “Metal Invaders” which later on ended up in a faster version on the band’s first full-length album. The first choice was to recruit former Tyran Pace vocalist Ralf Scheepers, however the band ended up finding an 18-year-old talent from the local Hamburg band Ill Prophecy, namedMichael Kiske. With their new lead singer they recorded Keeper of the Seven Keys, Part 1, released in 1987, which established Helloween as one of the most successful metal bands in Europe. In 1988 Helloween recorded Keeper of the Seven Keys Part II, their best-known album featuring the classic line-up. The band achieved even more success around the world than with “Keeper 1” and things were going extremely well. Guitarist Kai Hansen surprisingly left the band soon after the European tour for the “Keeper 2” album due to conflicts within the band as well as troubles with the record company, and a growing dissatisfaction with life on tour. He was shortly after replaced by former Rampage guitarist Roland Grapow, who finished the rest of the “Keeper 2” tour with the band. Helloween returned in 1994 with former Pink Cream 69-singer Andi Deris as their new lead-singer, and Uli Kusch, formerly of Kai Hansen’s new band Gamma Ray, on the drums, releasing their successful comeback Master of the Rings. However, in 1995 the band and its former members were badly shaken by the tragic suicide of original drummer Ingo Schwichtenberg, who never managed to recover from his illness. Dedicated to his memory, 1996’s The Time Of The Oath re-established the band as one of the most popular European metal bands. Following another world tour, a double live album called High Live was released. In 1998 Helloween released Better Than Raw, one of the band’s heaviest albums since the full-length debut. A cover-album called Metal Jukebox was released in 1999. 2000 saw the release of The Dark Ride, a more experimental and darker album than their previous releases. Immediately after the following world tour, Helloween parted ways with guitaristRoland Grapow and drummer Uli Kusch who together formed Masterplan. Replacements were soon found in guitarist Sascha Gerstner (ex-Freedom Call, Neumond), and drummer Mark Cross (ex. Metalium and Kingdom Come, currently in Firewind) who was later to be replaced by Stefan Schwarzmann, former drummer of Running Wild and Accept. Another studio album titled Rabbit Don’t Come Easy came in 2003 with a successful world tour following, including the bands first tour in the U.S. since 1989. 2005 saw yet another line-up change, following the “Rabbits on the Run” tour, as it became apparent that Helloween and Stefan Schwarzmann did not share the same musical vision. As further noted by the band, he had some trouble performing fast drum parts, so he was replaced by Dani Loble, the former drummer of German metal band Rawhead Rexx. A change in record company also followed as they inked a deal with German label SPV. 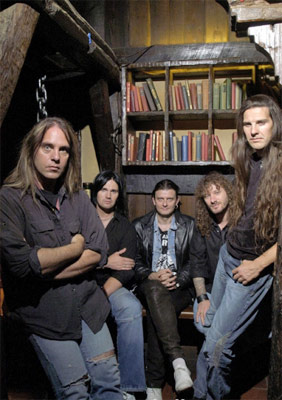 Any fears that what had now become a revolving door of band members would affect the quality of their new album were laid to rest as Helloween’s new studio album, titled Keeper of the Seven Keys - The Legacy, was released in October 28, 2005 in Germany, and November 8 in the U.S.A. to commercial and critical acclaim. The album had a pre-release single, Mrs. God, as well as a video for the track. The track Light the Universe was released as a single on November 22, featuring Candice Night of Blackmore’s Night on guest vocals. She also appears in the video clip for that track. Helloween has since completed their latest studio album Gambling with the Devil, which was released on October 23, 2007. It has received many positive reviews, with most fans praising the album as being one of the best Deris era albums. Despite being one of Helloween’s heaviest albums, it is noted for featuring more keyboards. “As Long As I Fall”, the first single, was released in early September and available only via download (save for Japan, where it was released on CD). The video for the song is available at their official site. Helloween teamed up with Kai Hansen’s current band Gamma Ray for their 2007/2008 “Hellish Rock” world tour, that started in early November 2007. Helloween were headlining and Gamma Ray were labeled as the “very special guest” with most shows also having fellow German “guest” Axxis. The tour went through Europe, Asia, South America as well as a few dates in the US. The tour is notable for Kai Hansen stepping on stage with his former band fellows Weikath and Grosskopf to perform hits “I Want Out” and “Future World” in the last encore segment of Helloween. On December 26, 2009, Helloween released the Unarmed – Best of 25th Anniversary album in Japan. The album was released on February 1, 2010 in Europe. The album is a compilation of 10 of the band’s best songs, re-recorded in different musical styles than the original recordings and by the current lineup. It features a 17 minute “Keepers Medley”, recorded by a 70 piece orchestra from Prague, mixing together “Halloween”, “The Keeper of the Seven Keys”, and “The King for 1000 years”. There is a limited edition digipak, including a 30 minute “making of”-DVD with interviews and studio footage. The bands website states that the album will be released on April 13, 2010 in North America via SONY & THE END RECORDS labels.